UNU-IAS and the Sustainable Development Solutions Network Japan (SDSN Japan), with the support of Nikkei Inc., the Global Compact Network Japan, and CDP, organized an event on Global Companies and the 2030 Agenda as part of its SDG Dialogue series. Bringing researchers and representatives of multinational corporations together, the dialogue examined how companies can contribute to mainstreaming the Sustainable Development Goals (SDGs). Specifically, speakers and participants discussed two key questions: integrating social and environmental agendas into corporate management beyond a corporate social responsibility (CSR) perspective and linking environmental, social, and governance (ESG) investment criteria to the 2030 Agenda for Sustainable Development. In the first of three keynote speeches, Taikan Oki (Senior Vice-Rector, UNU; Professor, University of Tokyo) urged companies to become trailblazers in integrating the SDGs into their long-term core business. He pointed out that the actions of global companies are increasingly monitored by investors and consumers, to their detriment if they fail to properly respond to the global agenda. Toshio Arima (Chairman of the Board, Global Compact Network, Japan; Executive Advisor, Fuji Xerox Co. Ltd.) highlighted the need to mainstream CSR into corporate management and core business operations. He also suggested using corporate resources to help advance solutions to issues affecting customers and society. Fulvio Guarneri (President & CEO, Unilever Japan Customer Marketing K.K.) discussed how Unilever, with its operations in 190 countries, has been making a difference in promoting the health and wellbeing of 2.5 billion people worldwide, reducing environmental impacts, and enhancing livelihoods. He noted that, setting sustainable living as its core mission, the company aims to mobilize collective actions for achieving the global goals. The panel discussion that followed, moderated by Junichi Taki (Senior Writer, Nikkei Inc.), extended the dialogue by considering the importance of the SDGs in corporate management and investors’ views on ESG investment. Panelists representing some global companies highlighted their practices and ideas for embracing the 2030 Agenda. 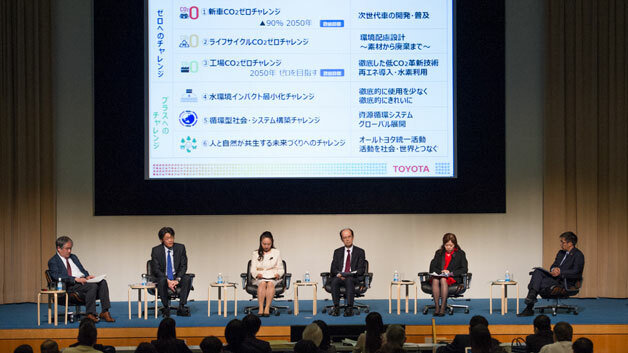 Takao Aiba (Project General Manager, Environmental Affairs Division, Toyota Motor Corporation) introduced six challenges which Toyota as a company aspires to address by 2050 in order to go beyond zero environmental impact and achieve a net positive impact. As Senior Manager, Secretary Division of AEON Co., Ltd., Yuriko Yamamoto indicated the SDG-related initiatives her company has undertaken by planting over 11 million Forest Stewardship Council (FSC)-certified trees, and empowering women through leadership positions. Norihiro Takahashi (President, Government Pension Investment Fund (GPIF)) revealed that GPIF considers ESG factors as a tool for maximizing long-term, stable returns on its investments. The panelists also identified obstacles. Given that the SDGs include 17 goals and 169 targets, it may be difficult for a company with operations in many countries, and multiple suppliers and business partners, to juggle all the goals, thus requiring prioritization based on its areas of focus. There is also varied and limited understanding among companies about what benefits SDGs can offer to expand their businesses and satisfy investors. Michiyo Morisawa (Japan Director, CDP) and Norichika Kanie (Senior Research Fellow, UNU-IAS; Professor, Keio University) enriched the discussion by assessing the recent business environment and stressing the benefits for companies to work on the SDGs in the context of the principles of responsible investment (PRI) and evaluation of corporate performance. Responding to a question posed by a participant, Kanie highlighted an initiative for raising awareness of the SDGs in Japan in collaboration with companies and university students. The event programme and presentation materials can be found under the Related Files tab.